The Cowgirl look is in, right??? It’s a girl’s dream, really…hours and hours of spa treatments, makeup application and a mani/pedi all in the leisure of your own home and even while laying in your own bed. But when an 8-year-old is you cosmetologist, the rules are a little different. Wait. There are no rules. Well, there are HER rules. That’s the only ones that matter. But when she sweetly sides up to me and says, “Sasha, do you wanna do a makeover?”, the ONLY answer is “YES!”. She gathered all the makeup (and I do mean ALL the makeup ~ even MINE!) and ALL the fingernail polish and proceeded to have me call her Lexie while she spoke in a British accent. Lemme tell ya…until you’ve heard a southern talking 8-year-old speak with a British accent, you’ve not heard it all. I tried to be a Plain Princess, but she thought I’d look MUCH better as a Cowgirl and told me how she would be fixing my hair in ponytails, ‘just like a cowgirl would’. It would be important to note that my hair is VERY short. Unfortunately, “Lexie” doesn’t work very fast, so we didn’t get to the hair part. (There was no ‘unfortunately’ about it…I was just FINE without my hair fix.) She did, however, get to the nail polish and ALL the makeup. I’m not real sure exactly HOW this is a Cowgirl look, but she was so pleased with what she had done and how it looked, I had to be thrilled, too. I want to make SURE you see the blush. We’ve had MANY conversations about how blush should be applied and what it’s mean to convey. 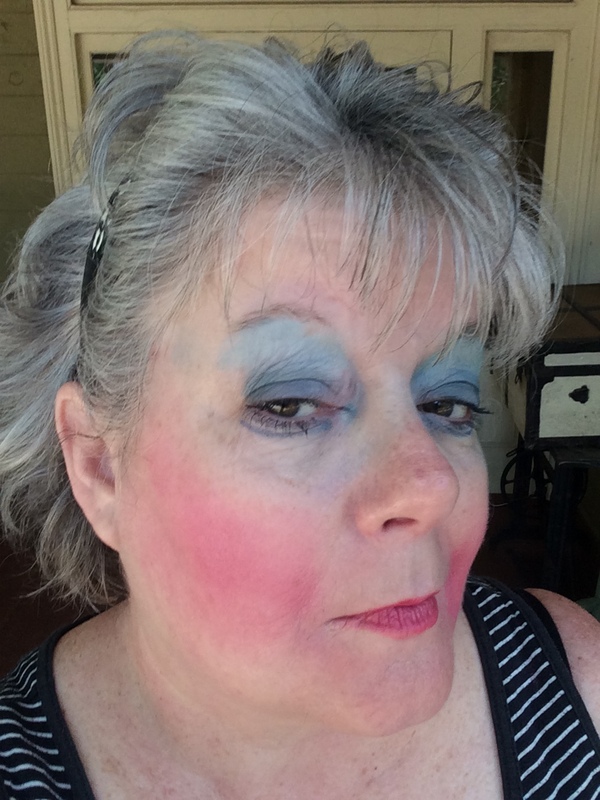 But she MUCH prefers the clown application; lots of color, swirling brush in circles on the face and then some more color just in case she missed a spot. Thanks for reading what I write and for hanging out with me! Previous How to break into a hotel room in the middle of the night…. Next Don’t call me Betty….or Papa John either…. Love the makeup story. I have had my share..love them all. Tater might just become the best cosmetologist teacher in North Carolina. OMG. Reminds me of my amazing grandmother who sat patiently for many “makeovers” at the mercy of my tiny hands. If only social media existed then to show off my prowess with “Wizard of Oz” green eyeshadow. Or “Heroin Chic” liner — as interpreted by a 7 year old. The Raggedy Ann rouge was too special for words. Your little artist may be cut from the same bolt of colorful fabric. Thanks for sharing and bringing back these very sentimental memories. What a sweet and funny story! I love her imagination – the name, the accent, the types of makeovers. You look mahhhhvelous!! Funny about the British accent. I have a beautiful niece from NC who is 91/2 who moved to England last year. She IS acquiring the “southern-British” accent for real! Love this! Sashay you are blessed with a sweet little girl. I so enjoy your readings. Thank you for sharing. I think Lexie was heading for that cowgirl/Panther fan look! Your blog is a joy Sasha! Write on! Love the heart of an 8 year old !! Precious ! Thanks for the the love of kids! You do look beautiful even though the blue eye shadow pulls it all together, I see a make up artist in the making!! Enjoy every minute of it and her her go for the sparkles, that’ll sure through you for a loop! LOL! I, too, have endured hours of hair style, makeup, mani and pedi’s! I love it! My GrandDaughter is VERY much into sparkles and glitter….and you just can’t get that all off! LOL As Beautiful as ever!!!! However, I must say she forgot the sparkles and glitter!!! Enjoy every minute of her wanting to do that to you, then they get bigger and you spend the money having the mani/pedi and make up with them at the spa! ….. lol doing that now with one grand daughter! ❤ ya to pieces! Kathleen ~ She would have put glitter everywhere if she had gotten her hands on it, but for some reason, she didn’t see it in the makeup bag!! And yes, I really do love it! love it, enjoy these moments! they grow up so fast!! Okay, I’ve laughed so hard I’m going to have to clean up around my computer and go find dry underwear. You certainly are a ‘sport’ and she will remember and cherish the fact that you let her do make-overs when she is old enough to realize just how you looked. Still laughing! Karen ~ I look at those pictures (because there are Many Many More!) and just laugh, too! It will be very funny to go back and look at them all and I’ve been keeping them all to see how she improves! !